Sweat or perspiration is a watery fluid excreted by the sweat (sudoriparous) glands of the skin of mammals. Sweat contains primarily water, but also salts and metabolic waste products—primarily sodium chloride, urea, lactic acid, and potassium ions (Blood et al. 2007). Sweat serves an excretory function for releasing excess water and waste products. In some animals, and in particularly humans, it also plays a role in regulating body temperature through evaporative cooling when the water in the sweat evaporates. The urocanic acid in sweat also may offer protection for the skin against ultraviolet radiation (Kent 2006). Sweating (as well as perspiration) refers to the production, secretion, and evaporation of sweat. The importance of sweating varies between species. Sweating is part of the intricate complexity of animals. In humans, it is part of a carefully coordinated process, controlled by the hypothalamus, to regulate body temperature. Furlow (2004) also summarizes some recent scientific evidence that molecules in the sweat from apocrine glands may be involved in a women's selection of a potential mate, guiding them toward those with genetically different MHC (major histocompatibility complex) profiles and ones potentially better for having healthy offspring. Sweat is exuded or excreted from the skins suboriferous glands—sweat glands. Sweat glands are exocrine glands, that is, glands that release their secretions through ducts into the external environment, or directly onto the exterior surface or an area contiguous with the exterior surface, not utilizing the blood to deliver the product. 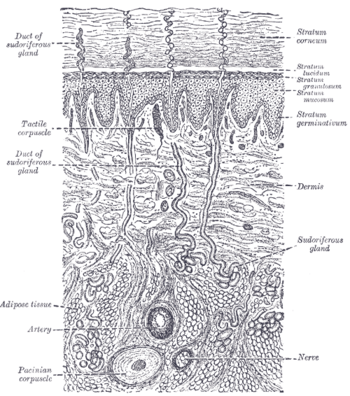 The dermis layer of the skin contains the sweat glands. Sweat contains water, sodium chloride, and small amounts of urea, lactic acid, and potassium salts, and is a much less concentrated fluid than blood plasma (Blood et al. 2007; Kent 2006). Sweat also contains the chemicals or odorants 2-methylphenol (o-cresol) and 4-methylphenol (p-cresol). The sympathetic nervous system regulates sweating, although the process can be stimulated by parasympathetic drugs (Stocking and Gubili 2004). Sweating can serve both an excretory role (nitrogenous excretion, removal of excess water, and so forth) and a role in temperature regulation. However, its importance for evaporative cooling varies greatly between species, with a much greater role in humans than in domestic animals (Blood et al. 2007). Among domestic animals, cattle have a high sweat rate of about 150 g/m2/h at 40 degrees centigrade, while sheep lose but 32 g/m2/h and dogs lose but an insignificant amount (Blood et al. 2004). Horses may have the highest rate of all (Blood et al. 2004). Primates have armpits that sweat similarly to those of humans. Animals with few sweat glands, such as dogs, accomplish similar temperature regulation results by panting, which evaporates water from the moist lining of the oral cavity and pharynx. It has also been proposed that components of male sweat can act as pheromonal cues (Wyart et al. 2006), and that the urocanic acid in sweat may help to protect the skin against the destructive action of ultraviolet radiation (Kent 2006). Eccrine sweat glands are distributed over almost the entire surface of the body in humans and many other species, but are lacking in some marine and fur-bearing species. In humans, they are particularly abundant on the palms of hands, soles of feet, and on the forehead. These produce sweat that is composed chiefly of water with various salts. These glands are used for body temperature regulation. Eccrine sweat glands are coiled tubular glands derived from the outer layer of skin but extending into the inner layer. The sweat glands are controlled by sympathetic cholinergic nerves, which are controlled by a center in the hypothalamus. The hypothalamus senses core temperature directly, and also has input from temperature receptors in the skin and modifies the sweat output, along with other thermoregulatory processes. Human eccrine sweat is composed chiefly of water with various salts and organic compounds in solution. It contains minute amounts of fatty materials, urea, and other wastes. The concentration of sodium varies from 35–65 mmol/l and is lower in people accustomed to a hot environment. The sweat of other species generally differs in composition. Sweating occurs even in cool weather but is particularly pronounced in hot or humid conditions and during periods of stress or physical exertion. Apocrine sweat glands are limited to only certain locations in humans, unlike eccrine glands, and they do not function in thermoregulation but rather serve as scent glands. They are mainly present in the armpits and around the anogenital area, as well as the ears, hands, cheeks, navel, and breast areolas. They develop during the early to mid puberty ages, approximately around the age of 13-15. The secretions of the apocrine sweat glands are thicker and more stick than the watery fluid of the eccrine sweat glands and contains fatty materials. These secretions are the main cause of sweat odor, due to the bacteria that break down the organic compounds in the sweat. Emotional stress, nervousness, and excitement increases the production of sweat from the apocrine glands, or more precisely, the sweat already present in the tubule is squeezed out. Apocrine sweat glands essentially serve as scent glands. During exercise or in hot or humid conditions, the copious sweating in the armpits is not from the apocrine glands but actually from eccrine glands located in the same region. Note that the name apocrine sweat gland is archaic; these glands are no longer believed to secrete their products by an apocrine mechanism in which the apical portion of the cell is sloughed off with secretory products inside. Rather, the apocrine sweat glands secrete in an merocrine fashion: membrane-bound vesicles bind to the plasma membrane of secretory cells and release products by exocytosis with no net loss of the plasma membrane. These glands are still called apocrine sweat glands to distinguish them from the eccrine sweat glands. Blood, D. C., V. P. Studdert, and C. C. Gay. 2007. Saunders Comprehensive Veterinary Dictionary Edinburgh: Elsevier Saunders. Retrieved December 6, 2007. Kent, M. 2006. The Oxford Dictionary of Sports Science & Medicine. Oxford: Oxford University Press. ISBN 9780198568506. Nadel, E. R., R. W. Bullard, and J. A. Stolwijk. 1971. Importance of skin temperature in the regulation of sweating. Journal of Applied Physiology 31(1): 80-87. Sato, K., W. H. Kang, K. Saga, and K. T. Sato. 1989. Biology of sweat glands and their disorders Journal of the American Academy of Dermatology, 20(4): 537-563. Retrieved December 6, 2007. Stocking, S., and J. Gubili. 2004. Mosby's Dental Dictionary. St. Louis, Mo: Mosby. ISBN 0323025102. Wyart, C., W. W. Webster, J. H. Chen, S. R. Wilson, A. McClary, R. M. Khan, and N. Sobel. 2006. Smelling a single component of male sweat alters levels of cortisol in women Journal of Neuroscience, 27(6): 1261-1265. Retrieved December 6, 2007.